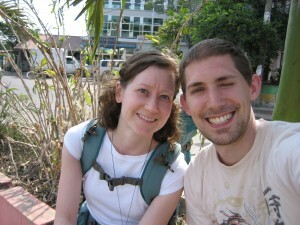 Friday (April 8th) was our last day in Belize. I have to admit that we weren’t sad to go home. We’d had a great time on our trip; saw a lot of extraordinary things, met nice people, ate good food, laughed a lot, learned a ton… but home was calling. Maybe even yelling. There was one night early on in our stay in San Ignacio that we discovered an army of ants in our room. They were climbing up the table to get to the bag of banana chips that I had thoughtlessly placed there a few hours earlier, intending to eat as a snack that night. After our best attempts to get rid of them ourselves and quite a few bites (pinches?) we walked over to the office and told them our dilemma (I wouldn’t have gotten any sleep that night in a room full of ants and it was already after 9:00). The very nice young man we talked to grabbed a can of Fish pesticide spray (probably highly toxic and possibly illegal in the United States) and came back to our room with us. He proceeded to spray the offending ants with the lethal liquid and then sprayed around the posts outside. He left the can there for us in case we found some more ants. The stuff worked. The ants were dead within minutes. Bee was being eaten mercilessly by flying insects, leaving him with large welts on his arms and legs. I managed to escape with just two bites, but as Bee will tell you, if it’s a choice between him and me the bugs will always go for him. It’s kind of odd. I think I mentioned the temperamental shower in an earlier post. Sigh. Then there was the bed in San Ignacio. It dipped down in the middle, so this trip literally brought us closer together. Bee got a pretty severe sunburn on the one day he chose not to wear sunscreen. It was hot. Did I mention that already? We had to buy drinking water at the weird little “grocery” stores that had canned and otherwise packaged food that had expired several years ago. We made sure the water was fresh. We couldn’t walk down the street without being hit up for money in some way. 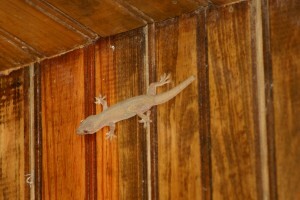 Our cute little gecko friend. But honestly, we had a good time. It was an awesome experience that made us both marvel at nature and the amazing architectural accomplishments of an ancient civilization. 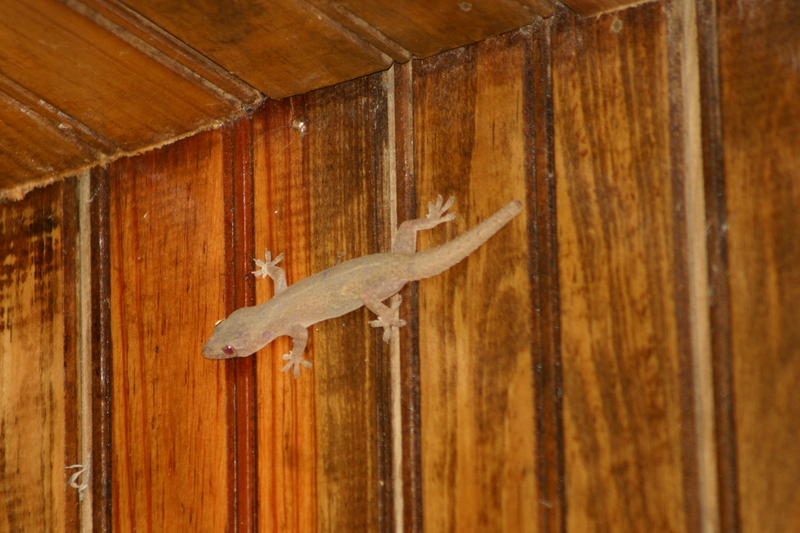 One day I noticed a cute little gecko hanging out on the wall inside our cabana in San Ignacio. I couldn’t get to the camera in time before it scurried behind the curtains. But the next time it was out, we were ready and Bee got a good picture. We were already talking about our next big trip before this one was over, so we must have had a good time. Although next time we think we’ll go somewhere with a lot of history and less bugs. 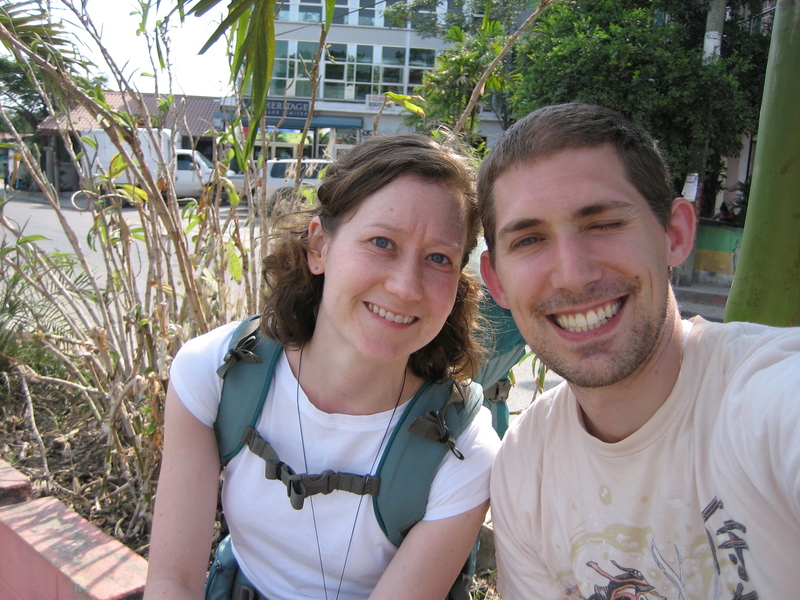 Waiting for the bus back into Belize City. So on our last morning, we had breakfast, grabbed our backpacks and walked the 10 minutes into town to catch the bus back into Belize City. As soon as we got to the square where the buses stop a taxi driver noticed us and asked if we were looking for a taxi ride to the airport. He said he would do it for some large some of money, and we said no thank you, we were taking the bus. He then sat down with us and continued to lower his price and try to convince us to let him drive us. I was finally so annoyed with him that I said, “We literally do not have the cash to pay you. We’re taking the bus.” This was a true statement. We literally had enough cash to get us to Belize City on the bus and then catch a taxi to the airport. And anyway, I was fed up with people trying to take our money. The taxi driver thought about that for a moment and then said he would come back later to see if we had made up our mind. Grrr. Well, it turns out that the first bus into Belize City was packed to the gills, so we had to wait another 45 minutes for the next one. At this point we were cutting it pretty close to making it to the airport on time, so when the bus came we were among the first to crowd around it and nearly elbowed some old ladies out of the way so we could get on. People there do not believe in nice orderly lines. I got on before Bee and snatched the last open seat (bench?) on the old school bus and told the next lady to get on that my husband was sitting with me. There was no way on earth my husband or I were staying in San Ignacio for a minute longer. After the nearly three hour bus ride we walked out of the bus station in Belize City right into a group of taxi drivers, who of course asked if we needed a ride to the airport, which we did. Bee asked how much it would be and one cabbie said, “$50 Belize.” I said, “We have $40 Belize.” He took us. 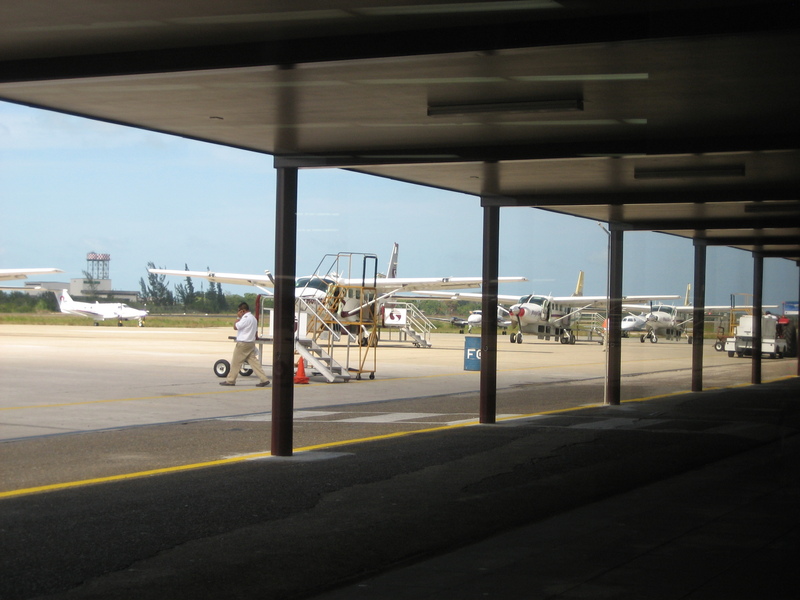 Belize has the smallest airport I’ve ever seen in my life. The two pictures below make up the entirety of the tarmac. 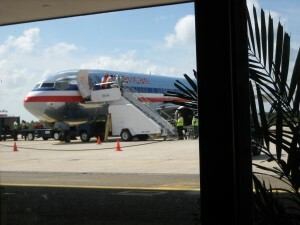 We had a nice view of our plane from our seats while we were waiting for them to get it ready for our flight. 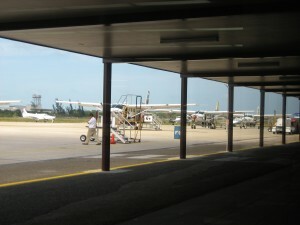 The rest of the airport. Our fight back to Dallas was uneventful, which is the best kind. I finished the book I had been reading on our trip (The Elegance of the Hedgehog by Muriel Barbery, which I would recommend to you) while Bee read over my shoulder. We ate a truly American meal in Dallas during our layover then walked down to our gate to wait for our flight to Seattle. Who do you think we found there? The two very nice gay men who I sat next to on the Caye Caulker water taxi! Small world. 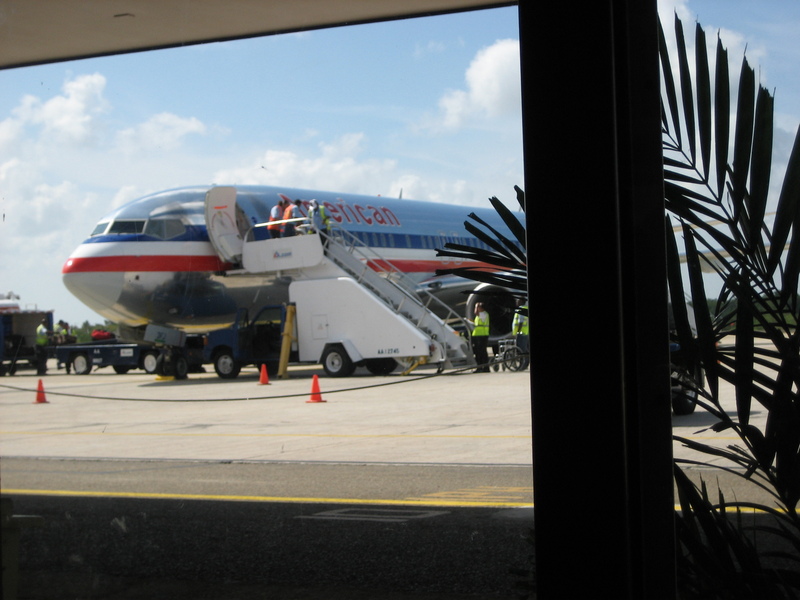 We talked about our trips, laughed, and commiserated together for a few minutes before we boarded the plane. It was a fitting end to our trip.